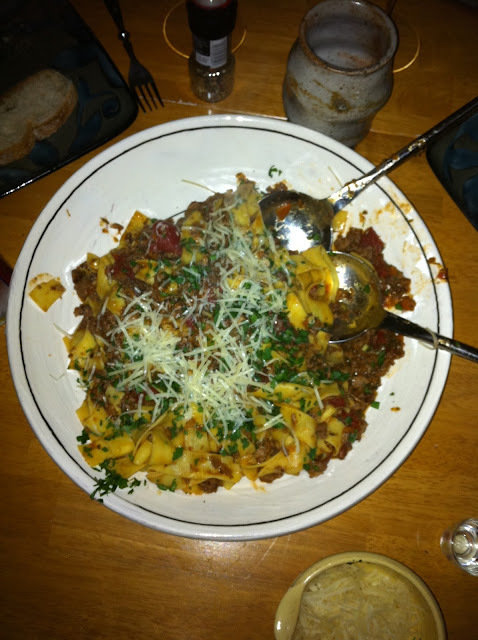 This was my first attempt at a ragu and everyone involved fell in love with it. The guestlist included most of the folks from The Night of Julia Child and we had both copious food and copious drink. The evening was rather impromptu; in fact I only asked if anyone wanted to come over around 3 PM and had folks over by 8. I adapted this recipe from Epicurious, so won't go into much detail except to say that you should prepare all the ingredients beforehand. It will make your life so much easier. Your soundtrack for this entry: The Halo Friendlies - Run Away. I would love it, thanks!